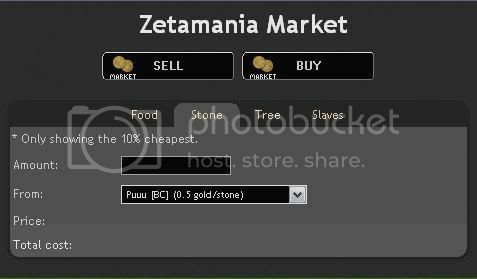 Buy it and send it right back on the market at 0.9 - 0.93 gold/stone. NOOOOO you guys are ruining my StG!! Mager, take the initiative, dont buy over 0.8 and make sure all StGers on the map do the same, voila! It becomes the buyers market! i dont een know how to StG this is my first era and i reliased that im on Valhalla I thought the market was fror everyone. omfg mager y rent there any people in the recuutment KD! u r supposed to accept their applications!! Dont mind mager he is a friend of mine i brought him to the game but apparently he isnt listening to the info i give him.. I never go over 65% b/c its just a big waste of MUs for little increase of %. lol percentage will go up bc i dont only use my spellweavers for StG..
im level 9 magic already so im an active mager now.. If you StG with a % higher then 65% you will waste more MUs for nothing, plain and simply. Casting Stone to Gold from Magic Armoury upon Magic Armoury with 69% chance of success...successful, 3899967 of the stone in Magic Armoury was made into gold. We lost 1088 Spellweavers. I had 9 mill stone when I casted it..
and I have 1k warehouses..
What is the problem why didnt it convert at least 8 mill??? 11:59:15: Mr. Phoenixblaze cast a spell upon us... Casting Stone to Gold from Colony upon Colony with 59% chance of success...21546195 of the stone in Colony was made into gold.